‘Early sources’, as used here, refers to sources of linguistic and anthropological interest that are relatively old and often hard to come by. 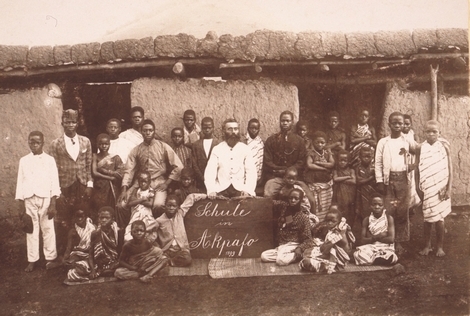 This includes early descriptions of African languages but also photos and text from missionary archives. One of the goals of The Ideophone is to make such sources freely available where possible. As it happens, this singular feature of Yoruba would turn out to be not so unique among African languages. With Kanuri joining Yoruba (Vidal 1852) and Ewe (Schlegel 1857), we now have three independent claims from the 1850’s on the significance of ideophones in three major African languages. Although I do not exclude the possibility of finding yet earlier sources, things are starting to look like we may justifiably call this period the decade of the discovery of ideophones in Africa. Koelle, Sigismund Wilhelm. 1854. 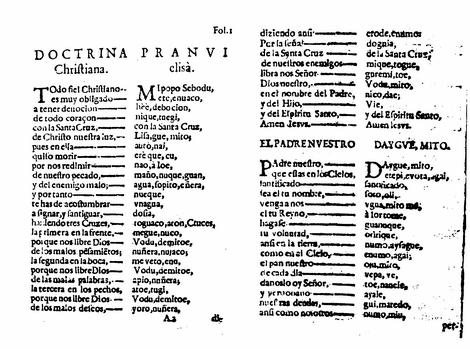 Outlines of a grammar of the Vei language, together with a Vei-English vocabulary. And an account of the discovery and nature of the Vei mode of syllabic writing. London: Church Missionary House. Koelle, Sigismund Wilhelm. 1854. African native literature, or Proverbs, tales, fables, & historical fragments in the Kanuri or Bornu language. London: Church Missionary House. Koelle, Sigismund Wilhelm. 1854b. Polyglotta Africana London: Church Missionary House. Schlegel, Joh. 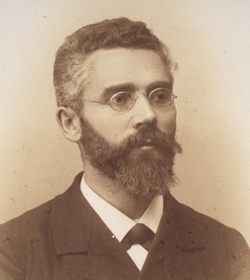 Bernhard. 1857. Schlüssel der Ewesprache, dargeboten in den Grammatischen Grundzügen des Anlodialekts. Stuttgart. In pursuit of early written sources about Kawu I came across a useful summary of explorations in the Volta Basin in the 1870s and 1880s. The document is clearly based on some dead serious German reports from around the same time, but it is written in a dry tone with barely submerged irony as only the British can do it. N.N. 1886. Recent Explorations in the Basin of the Volta (Gold Coast) by Missionaries of the Basel Missionary Society. Proceedings of the Royal Geographical Society and Monthly Record of Geography 8, no. 4. 2 (April): 246-256. The steady influx of vocabularies of ‘exotic’ languages during the nineteenth century caused a veritable flowering of comparative philology in Western Europe. It became en vogue to be looking at languages from outside Europe, and the late nineteenth century especially seems to have been a time in which every gent in academia (and yes, they were mostly gents) had to have dabbled in African philology. One such gent was Harry Thurston Peck (1856-1914). A classicist who would later become known for such works as Latin Pronunciation (1890), an edition of the Suetonius (1889), and most importantly the Harpers Dictionary of Classical Antiquities, he apparently had access to some dictionaries of West African languages in the 1880’s and could not, of course, resist the temptation to do something with it. The results were published in the American Journal of Philology in 1886. The earliest description of Kawu (Akpafu) I have found so far is quite special in that it was written by an African in an African language. A German translation of it appeared in 1889 and can be found below. The original is a report of a travel made in early 1887 by David Asante. David Asante1 (1834-1892) was the son of a christianized chief in Akropong, and one of the first Africans to be trained in Basel. Together with a few unnamed white missionaries, Asante travelled throughout what is today the central Volta Region of Ghana, visiting Nkonya, Boem, Akpafu, and Santrokofi (amongst other places). He wrote down his experiences in Twi and sent the report to Basel, where it was subsequently translated into German by J.G. Christaller, one of the founding fathers of West African linguistics.2 The translation was published in 1889 in the transactions of the Geographische Gesellschaft für Thüringen zu Jena. We arrived in Akpafu somewhere around nine; the town is big, its main street wide. When we arrived, all of the townspeople flocked together to see us — even the smiths stopped their work — because there had never been a European there before. Had it depended just on them, we would have stayed for several days. They first led us to a place where we could refresh ourselves; from there we went to salute the king, an old, powerfully built man.3 (…) Their giant king was very amiable and wanted us to stay for several days; however, our schedule did not permit us to do so. Of the people of Boem, these are the brightest. (…) Because of their ironwork, everything is well-organized; for people from all places come here to buy iron tools. (…) The diligence of these people, their hospitality, and their tranquil behaviour pleased us so much that we really came to love them. 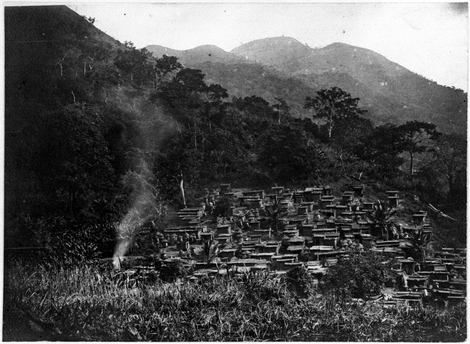 In an excellent post over at Greater Blogazonia, Lev Michael unravels a spectacular error which led several eminent specialists of American languages to believe that a West African language named Arda was actually spoken on the Amazon between the Nanay and Marañon Rivers. Lev’s post is recommended reading (as is his blog Greater Blogazonia in general), so in what follows, I will assume that you’ve at the very least glanced through his fascinating analysis of how this error came to be propagated in quite a few reference works on the indigenous languages of southern America. 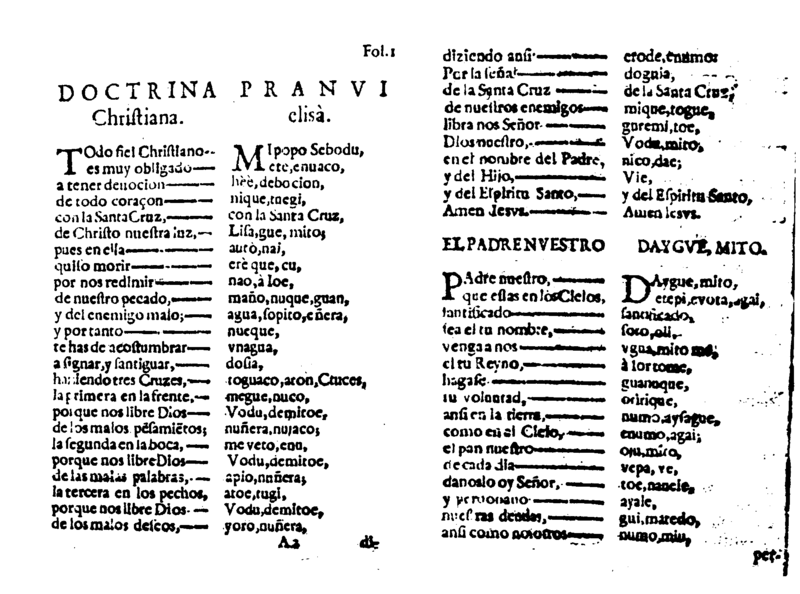 It seems very fitting to me that Lev’s excellent piece of sleuthing comes at this point in time, exactly 350 years after the first appearance of José de Najera’s Doctrina Christiana y explicacion de sus Misterios en nuestro idiom Español, y en lengua Arda, the mysterious manuscript that is the pivot on which all of this hinges. So go read his exposé and after that, feel free to check back here for some more background information. One of the goals of The Ideophone, besides functioning as a sounding board for ideas on expressivity and sound symbolism in African languages, is to make available sources on Siwu and other GTM languages which are otherwise hard to come by. This posting is the first in a series furthering that goal. Below you will find the full text (in German)1 of an early account by Pfisterer, the first missionary to live in Akpafu. Ignoring the colonial tone of voice and the inevitable racial prejudices, we get valuable information on sociolinguistics, oral history, housing, smithing, socio-economical conditions, polygamy, and slavery. Before giving the floor to Pfisterer, let me provide some context to his account (if you can’t wait, you can skip right to Pfisterer’s own words — don’t forget to look at the beautiful picture below, though!). 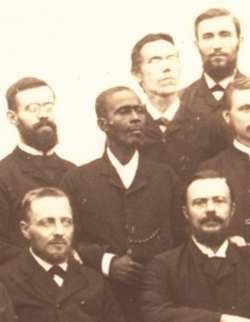 A lot of material documenting the missionary history of Akpafu can be found in the archives of the Norddeutsche Missionsgesellschaft, which have been deposited at the Staatsarchiv Bremen. More often than not, these missionary documents consist of only marginally interesting chitchat about building projects, visitations of other mission posts, and the health of the missionaries, but every once in a while we get more ethnographic detail. 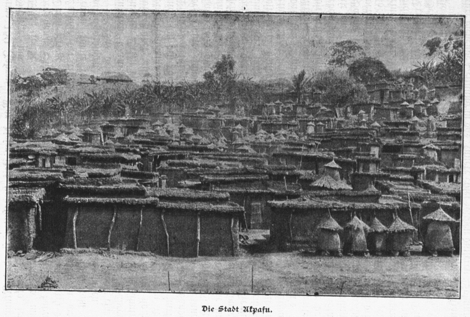 One source offering such detail is a 1904 piece by Andreas Pfisterer on Kawu and the Mawu in the periodical Monatsblatt der Norddeutsche Missionsgesellschaft. 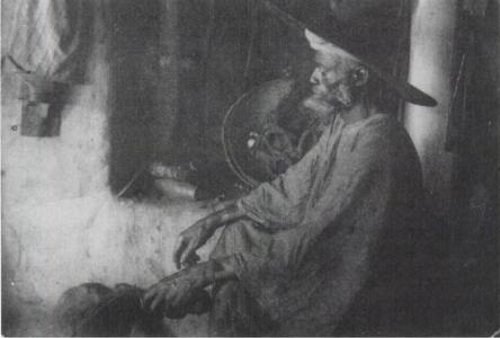 Pfisterer was the man who established the first mission post at ‘Akpafu’ (today’s Akpafu-Todzi) in 1897. He was originally with the Basel Mission, but was ‘dismissed in 1899’,2 upon which he changed to the Bremen Mission and stayed in Ghana until 1910. According to a brief history of the station by one of the later missionaries, Hermann Schosser (Schosser 1907), Pfisterer had abandoned the Akpafu station by 1902, leaving behind an unfinished house and the indigenous catechist Mensa with his Christian family. Pfisterer’s account was published in two parts, and in an attempt to keep the postings here within reasonably length I will keep to that division, reproducing the first half of his account below and the second half in a second posting. I have marked a few obvious errors that were present in the source; any remaining typographical errors are probably mine.